Commissioner of Police Abdulla Riyaz has denied obstructing the Elections Commission (EC) from conducting the presidential election scheduled for October 19, insisting that police only refused to provide security as the guidelines laid down by the Supreme Court judgment were not followed by the EC. “That is the truth. The list was not prepared,” he said, referring to the refusal of Progressive Party of Maldives (PPM) candidate Abdulla Yameen and Jumhooree Party (JP) Gasim Ibrahim to sign the voter registry as required by the Supreme Court guidelines. An hour before polls were due to open on Saturday, the EC issued a statement declaring that police had moved to prevent the election from taking place. “As we continued with [preparation for] voting, the Maldives Police Services have said no document relating to the election can leave the commission’s offices, stopping the election,” the statement read. Riyaz however insisted, in the face of repeated queries from MPs, that police did not block the election, conceding that a court order would be needed for police to take such an action. “Police sent a letter to the Elections Commission on 19 October. In it I said that the Supreme Court ordered all state institutions to ensure that matters are proceeding according to the Supreme Court guidelines,” he said. He added that “no further communication” – apart from the letter stating that police could not offer security or cooperation to the EC – was exchanged before the commission announced the cancellation of polls. However, an internal inquiry has been launched by the police professional standards command following the allegations by EC Chair Thowfeek, Riyaz told MPs. Riyaz argued that the election could not take place because the EC was not “well prepared”, as he believed the time period offered for candidates to approve the voter registry was not sufficient. Riyaz stressed that the police decided to not provide cooperation to the EC rather than obstructing the commission from conducting the polls. The decision was made based on advice from the National Security Council, he said, which consists of the president, vice president, attorney general, chief of defence forces and the defence minister. Police considered the consequences of proceeding with the election while two candidates were refusing to participate, Riyaz said, suggesting that violence and unrest would have occurred. He also suggested that candidates would have found it “harder to refuse” to sign-off had the EC sent the voter list in parts as soon as the re-registration forms were processed. The commissioner assured “full cooperation” from police to the EC to conduct the presidential election, adding that he believed a president-elect must be sworn in on November 11. “It is the people who are supposed to prevent others from obstructing the election, who have obstructed the election today. The police were also ordered to provide protection, security of ballot boxes and papers. The police stopped the election using the excuse that all three candidates did not sign the voter registry. But the Supreme Court verdict does not give the police the authority to oversee that,” he said. “The police refused to provide security. The verdict clearly says the police must accompany the ballot boxes and papers to the polling stations. But last night the police said they will not facilitate the process. If we dispatch the boxes without police cooperation, then the Supreme Court has the space to annul the election [again],” he continued. Former President Maumoon Abdul Gayoom has this week said there could be no doubt that the murder of Progressive Party of Maldives (PPM) MP Dr Afrasheem Ali was a politically motivated attack, while calling for justice to be expedited against his alleged attackers. No individual has yet been convicted of the killing of Afrasheem, who was found dead on the staircase of his home in Male’ on October 1, 2012. A total of seven individuals are potentially facing charges in connection to the MP’s murder, with the trial of key suspect Hussein Humam currently ongoing at the Criminal Court. Humam had initially denied charges against him in court. He later confessed to the crime at a hearing held in May, according to a statement read out by prosecutors in the court. State prosecutors read out the statement, which was said to have been given by Humam at one of the initial hearings. The suspect retracted his confession a month later, claiming that he had been coerced by police at the time. Humam’s father has also written to the Criminal Court and the Human Rights Commission of the Maldives accusing police of conducting psychological abuse against the suspect, and exerting coercion to make him confess to a crime he did not commit. Speaking Wednesday (October 2) at a rally to mark a year since Dr Afrasheem’s death, Gayoom was quoted in local newspaper Haveeru as saying that society remained in a state of fear as a result of the MP’s “politically motivated” killing. “This was a clear message to our nation. It means that anyone who dares to speak up will suffer the same fate,” said the country’s one-time autocratic ruler, who was in power for 30 years until the Maldives’ first multi-party democratic elections in 2008. Police have meanwhile confirmed this week that cases had been filed with the Prosecutor General’s Office (PGO) against Azleef Rauf, Shaahin Mohamed, Adam Salaah and Abdulla ‘Jaa’ Javid – son-in-law of opposition Maldivian Democratic Party (MDP) Chair ‘Reeko’ Moosa Manik in connection to the murder. Despite not a single trial related to the murder having yet been concluded, PPM MP Ahmed Nihan confirmed that former President Gayoom had claimed there was a political motive to Afrasheem’s attack. However, Nihan said Gayoom had not identified any one party or culprit in particular for the crime. “[Gayoom] said the murder of Afrasheem was connected to politics and that such attacks should be eliminated and solved or they will begin to be copied by the public,” he said. Nihan said that like Gayoom, he believed that since police had begun their investigations into the attack, they had uncovered enough evidence to suggest the murder had been carried out for political reasons. He claimed that the PPM had purposefully avoided “finger pointing” of any particular party, but criticised politicians within the opposition MDP for making statements in an attempt to undermine the credibility of the police investigation into the case. Nihan said that the country’s MPs had a responsibility to minimise doubt among the public concerning the conduct of the Maldives Police Service (MPS) in investigating the murder, adding it was important society have faith in law enforcement officials to solve the case. The Maldives Police Services (MPS) announced in October 2012 that the FBI were extending assistance in the investigation of the MPs murder. By December, Commissioner of Police Abdulla Riyaz stated during a press conference that the murder of Afrasheem had been carried out with a political motive, and that the culprits were to be paid MVR 4 million (US$ 260,000). Soon after the murder police arrested two MDP activists – Mariyam Naifa and Ali Hashim ‘Smith’ – in connection with the attack. Both suspects were later released without charge. The MDP later accused the government of attempting to frame the party with “politically-motivated arrests” of its members. In November 2012, former President Mohamed Nasheed accused the government of negligence in its efforts to bring the perpetrators to justice. Ongoing death threats received by the Elections Commission (EC)’s permanent staff and polling station officials have prompted the commission to file a report with the Maldives Police Service (MPS) today. A lack of state cooperation prevented the commission from holding a “free and fair [presidential election] vote without intimidation, aggression, undue influence or corruption” on September 28 as constitutionally-mandated, the (EC) announced on Friday night, shortly before it was surrounded by a police barricade. Lack of police support, “some political parties” threatening to set ballot boxes on fire, and death threats made against Elections Commission members, staff, and officials involved in the voting process were highlighted as reasons for postponing the second round run-off, which would otherwise have taken place yesterday. Special Operations police surrounded the EC secretariat on Friday, with orders from Police Commissioner Abdulla Riyaz to take over the building and ballot papers should it proceed with holding the election. In addition to the MPS stating it would not cooperate with the EC and ceasing to providing security requested by the commission for the second round, police prevented EC staff and visitors from entering the secretariat on Friday. However, staff were later allowed to return after a series of phone calls between Riyaz and EC Chair Fuwad Thowfeek. As of Thursday, the EC insisted that it was constitutionally mandated to hold the runoff within 21 days of the first round, in spite of an order from the Supreme Court to suspend the election indefinitely. This prompted Assistant Commissioner of Police Hassan Habeeb to call the Elections Commission Chair on Thursday night (September 26) and warn that police would not allow the election to take place. “It’s not just myself and my family, but Elections Commission staff, including most directors and even some heads of ballot boxes and other polling station staff who have received threatening messages that they and their families will be killed,” Elections Commission Chair Fuwad Thowfeek told Minivan News today. “They are very much scared about the situation. Some are even afraid to come out of their homes. It’s very sad,” Thowfeek lamented. “I hope we will be safe, we have been trying to follow the constitution,” he said. Thowfeek said the EC had sent a report to the MPS detailing the threats, phone numbers the messages were sent from, and other relevant information. Only the EC’s human resource section and other section heads of the commission have a list of all election officials and temporary staff, explained Thowfeek. The commission had provided the four political party presidential candidate representatives with a list of all elections officials, including polling station staff, but that list did not include their phone or ID card numbers, he noted. The Police Integrity Commission (PIC) called for the police to provide any assistance the EC requires to go ahead with the second round. Earlier this month the PIC determined Police Commissioner Abdulla Riyaz violated the Police Act by posting a letter on Twitter urging police officers not to vote for former President Mohamed Nasheed and recommended administrative action be taken against the police chief. Minivan News enquired with the PIC whether Commissioner Riyaz would be able to impartially issue orders to prevent the EC from conducting election preparations and holding the second round runoff, or whether the MPS – under his leadership – would be able to impartially investigate the death threats EC staff have been receiving. PIC Director General Fathimath Sareera Ali Shareef told Minivan News today that she needed to consult with their legal department and would reply as soon as possible. She had not responded at time of press. Police meanwhile remained outside the Elections Commission until yesterday (Saturday) evening, guarding the secretariat and patrolling the road, noted Thowfeek. “It was our request to have the police in front of the security room, on the ground floor [of the secretariat], and surrounding the building so nobody could enter from behind. They are keeping full security of the building for the protection of the commission and our own safety,” said Thowfeek. The Elections Commission confirmed there was “no danger” its data could be tampered with because it remained “fully protected” and is being “closely monitored”. The commission’s server was intentionally shut down on Friday night to prevent anyone from accessing data through a “remote medium”, explained Thowfeek. Additionally, beginning Friday night, the EC established a rotational schedule to ensure staff are present in the EC’s secretariat 24 hours a day, seven days a week, “so there is no chance an outsider can get in” and tamper with any materials or data, he continued. “Our own staff are present in the IT, security, and records section rooms – the most important places are constantly monitored,” said Thowfeek. Thowfeek also explained the “misunderstanding” between the MPS and the EC that led Special Operations police to surround the secretariat and prevent staff or visitors from entering, with orders from Police Commissioner Riyaz to take over the commission and arrest staff who disobeyed the Supreme Court order to halt presidential election preparations. After a Raajje TV journalist called to enquire about the situation, Thowfeek explained to the reporter that “even staff and visitors were not allowed” to enter the EC. This led Police Commissioner Riyaz to contact Thowfeek and explain that police were sent to protect the commission against any “angry people” trying to enter the EC and harm its staff, according to the EC Chair. Riyaz also instructed Thowfeek “not to listen to stories from different people about the situation”. Thowfeek then sent the EC’s Secretary General and Director General downstairs to confirm what was occurring. The commission’s IT and coordination section directors had been prevented from entering the building and police informed the Secretary General that visitors would not be allowed to enter on Saturday either. The EC Chair again contacted Riyaz and explained that the action being taken by the special operations police differed from what the Police Commissioner had said the MPS officers would do. Fifteen minutes later, Elections Commission staff with proper identification were allowed into the building and the commission was informed that invited visitors would be permitted to enter as well. Minivan News had journalists present inside and outside the EC secretariat building throughout the events and did not observe protesters present at the time Special Operations police surrounded the building. EC officials had previously planned to meet the British High Commissioner in the commission’s secretariat on Saturday, however after the EC’s Secretary General was informed by police Friday night they would not be able to hold the meeting in the commission, it was relocated to the High Commissioner’s hotel, explained Thowfeek. “He hoped for a quick solution and wished us [the EC] well,” he added. A team of Nigerian election observers also arrived on Friday and were “very much disappointed” polling did not take place, explained Thowfeek. However, because they “made such a long trip” the EC has still been working with the West African observers and providing information about the electoral process. The Danish Ambassador and the Commonwealth [observation group] Chair met with EC officials Friday, noted Thowfeek. “We have had no news from any other [international election] observers,” he added. Holding the second round – or another first round – of the presidential election will now “not be possible before November 11 within existing elections laws”, Thowfeek told Minivan News. While the EC usually requires 60 days of preparation time for the whole process, “even if we don’t waste a single minute” 45 days will still be required before another presidential election can take place, he continued. “We have to update the voter list, gazette it, receive complaints and input from the public regarding the list, see who will be present where on that date and allow them to re-register accordingly, add just-turned 18 year-olds and remove anyone who has died during the [voter registry updating] process, etc,” he noted. Thowfeek explained that general and presidential elections law mandates specific periods of time are given for each step of the election preparation process, for example the voter registry must be published in the government gazette 45 days before polling, 10 days are given to submit complaints, and five days are provided to file cases of unaddressed complaints with the High Court. “If special laws are made, then maybe it will be possible,” said Thowfeek. “We have just 42 days left before [the end of the presidential term on] November 11, so time is limited,” he added. The date for the Supreme Court’s verdict in the Jumhooree Party’s case against the Elections Commission remained unscheduled at time of press. The Human Rights Commission of the Maldives (HRCM) has called on the Supreme Court and state institutions to ensure that Maldivians not be stripped of the right to vote, guaranteed by constitutional article 26 and the International Covenant on Civil and Political Rights (ICCPR), and to ensure that there would be an elections within the duration stated in the constitution. HRCM also called on everyone not to pave way for unrest and to hasten all work that had to be done to uphold the constitution. The commission also called on the EC to solve all the issues with the voters’ registration. HRCM further called on the authorities to take legal action against those to pose death threats and threats of violence and also called on everyone to give high priority to national interest. Transparency Maldives, the HRCM and the Maldivian Democracy Network observed the first round and praised the EC’s free and fair electoral process. Global condemnation followed the Supreme Court’s issuing of the injunction, with the UK, EU, and the Commonwealth specifically calling for the run-off to go ahead as scheduled. International election observers unanimously commended the first round of polling, calling for losing parties to accept defeat and allow the second round to proceed as scheduled. The Commonwealth’s human rights and democracy arm has since “expressed concern at developments” in the Maldives following the first round of elections. The Election’s Commission is meanwhile “going ahead” with preparations for the upcoming local council and parliamentary elections. “We are doing the work for local council elections to take place in December , said Thowfeek. “[Additionally] last night we issued one draft document for constituencies. According to the law, eight months before the existing term of Parliament expires, we have to check the population figures from various localities and [based on the data] create a report on how constituencies should be formed for the next election,” explained Thowfeek. Currently there are 77 seats in the People’s Majlis, however 85 seats will be needed, he added. The Parliamentary election is scheduled to take place on March 2014. Commissioner of Police Abdulla Riyaz violated the Police Act by posting a letter on Twitter urging police officers not to vote for former President Mohamed Nasheed, the Police Integrity Commission (PIC) has determined, recommending administrative action against the police chief. The PIC said in a press statement today that an investigation was launched following media reports of Riyaz’s tweet on August 20. The case was already under investigation when the Elections Commission (EC) forwarded a complaint regarding the letter, the police oversight body said. The PIC found that the police chief violated articles 7(a)(3) and 69(b) of the Police Act as Riyaz admitted to posting the letter on his official twitter account, which the commission determined to be declaring “support for the content of the letter” despite it first appearing on another twitter account. Based on its findings, the PIC advised the Home Minster to take “administrative action” against Riyaz under article 67(a) of the Police Act. The types of administrative penalisation provided for in the law include counselling, requiring completion of special training, providing special counselling to improve capacity, transferring to another post, placement under close supervision, demotion and termination. In a dissenting opinion noted in the commission’s statement, PIC member Ali Nadheem contended that in addition to recommending administrative action, the case against Riyaz should be forwarded to the Prosecutor General’s Office for criminal prosecution. Following media reports of Riyaz’s tweet, President Dr Mohamed Waheed Hassan Manik told local journalists last month that he imagined the tweet had been posted in the commissioner’s personal capacity. Former President Nasheed resigned on February 7, 2012 in the wake of a violent mutiny by police officers of the Specialist Operations (SO) command, who disobeyed orders and broke the chain of command, assaulted government supporters, ransacked the MDP Haruge, launched a protest at the Republic Square, clashed with the military and stormed the state broadcaster. In the aftermath of the police mutiny and clashes at Republic Square, Commissioner of Police Abdulla Riyaz – a civilian at the time – was among three senior ex-servicemen under former President Maumoon Abdul Gayoom who went inside military headquarters to relay the protesters’ demand for President Nasheed’s “unconditional” resignation, after which they accompanied Nasheed to the President’s Office where he announced his resignation at a live press conference. Riyaz and current Defence Minister Mohamed Nazim were seen taking Nasheed’s resignation letter to parliament. However, Nasheed’s insistence that his resignation was “under duress” in a “coup d’etat” orchestrated by the then-opposition working with elements of the security forces loyal to Gayoom was later rejected by a Commonwealth-backed Commission of National Inquiry (CoNI), while also calling for action against unlawful acts committed by the security forces. “Whichever individual becomes president tomorrow can no longer just change the constitution, the existing law. That individual, holding the presidency, can only bring such big changes with a parliamentary majority,” said Riyaz, challenging the MDP to confirm or deny the authenticity of a leaked document purporting to be the party’s policies for reforming the security services. “The MDP notes that this is unfortunately not the first instance where Mr. Riyaz, appointed in dubious circumstances, has used his position in a blatantly politically manner. The MDP would like to draw attention to Mr. Riyaz’s role in the February 7, 2012 forceful overthrow of government, subsequent police brutality, impunity and lack of accountability, politically motivated detentions, unconstitutional barring of Raajje TV from Police Service events, the refusals to accept summons by parliamentary select committees and the extensive interview he recently gave on a policy which was alleged to be the MDP’s,” the statement read. Police Commissioner Abdulla Riyaz has dismissed opposition allegations of the possible politicisation of officers during the presidential election, scheduled for September 7, maintaining that the institution is bound by the “law of the land” and not any one individual. In the lead up to this month’s polling, the opposition Maldivian Democratic Party (MDP) has continued to accuse the chief of police of conducting “overtly political” actions, while also being a key player in the controversial transfer of power on February 7, 2012 – which it maintains was a “coup d’etat”. Commissioner Riyaz is currently under investigation by the Police Integrity Commission (PIC) over the temporary publication of a letter on Twitter that was allegedly written by a third party urging officers to vote against MDP candidate and former President Mohamed Nasheed. Nasheed resigned from office last year following a police and military mutiny that led to Riyaz being appointed as chief of police. While the investigation over the Twitter case is pending, the PIC yesterday ruled that the commissioner had been appointed to his position in compliance with the Police Act, and that his appointment was lawful. Meanwhile, Riyaz stressed in July this year the police service will continue to refuse any orders it decides are “unconstitutional” after expressing concerns over leaked proposals allegedly devised by the MDP to reform the country’s security forces should it win the upcoming election. Speaking to media in Male’ today, the police commissioner said the institution was committed to transparency in providing election security. However, he declined to discuss the investigation into the content of a previous controversial post on his official Twitter page, or the issue of why officers were today seen by local media removing campaign posters and images posted on private property, depicting a violent crackdown against MDP supporters by authorities directly following the change in government last year. The commissioner said he could only answer questions on matters relating to Saturday’s election, while also rejecting accusations that the Maldives Police Service favoured any specific candidate during voting. Riyaz told Minivan News that the MDP – as the country’s sole opposition – has been invited to four separate meetings held for political parties to discuss any concerns regarding the police strategy to produce election security on polling day. He added that the party had declined to attend on all occasions. “My message would be is that all officers must act in accordance to the law and human rights,” Riyaz said. The commissioner also today updated local media on the police service’s election security plans that will see officers stationed on all inhabited islands by this evening under the name ‘Operation Blue Waves‘. Riyaz said he was calling on all “political actors and their supporters”, as well as the general public to ensure officers were provided with maximum cooperation to officers involved in providing security during the election. “I also urge everyone to maintain peace, and should they have any concerns, to address them within due process,” he advised. 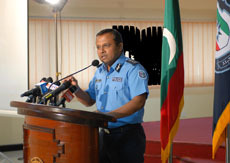 In comparison to the country’s first multi-party election held in 2008, Riyaz described the present election campaign period as being generally peaceful despite a “few incidents” occurring, arguing he had received no complaints of any presidential candidate being refused entry to islands. “I have personally observed how ready our teams are to deal with any situation that may arise. Each officer knows their role and responsibility. We are working closely with the Elections Commission (EC) under an MOU we signed, and are also working with the Maldives National Defence Force (MNDF). I am certain that this election day will proceed peacefully, without incident,” he continued. Despite anticipating a peaceful vote, Riyaz added that SWAT teams and Special Operations (SO) Officers had been provided with election-related training, but would only deployed as a “last resort”. “Here is the thing, we will only be using the ‘Blues’ [general police officers] for election security purposes. Only if things escalate, and special response teams need to be deployed will we use the SO and SWAT teams. They will only be used as a last and final resort when we absolutely have to. We will try our best to avoid deploying them,” he responded. The commissioner said that UN human rights experts had also held training with both the SO and SWAT teams on overseeing polling efficiently. “The team they trained then held wider sessions for the rest of the police force. Our aim is to protect all citizens of Maldives, and all officers are trained to do so,” he said. As part of the police’s election security strategy, Riyaz added that the Commonwealth had also provided a technical expert who was continuing to assist the institution and provide feedback on their plans for the election day. The technical consultant, Eldred de Klerk, today met with officers from the country’s South Police Division based in Addu to try to get an understanding of their work and technical capabilities available on the ground during polling. Government authorities have awarded 600 apartments to Maldives Police Service (MPS) and Maldives National Defence Force (MNDF) personnel this week, including to Police Commissioner Abdulla Riyaz and senior police officers. The housing development projects – providing 300 apartments for MPS, and 300 for MNDF officers – are being jointly managed by the government-owned Housing Development Corporation (HDC) in conjunction with the Police Cooperative Society (POLCO) and the MNDF co-operative SIFCO. The opposition Maldivian Democratic Party (MDP) has described the awards as a continuation of the patronage policies that prevailed under the 30 year autocracy of Maumoon Abdul Gayoom. Under the MPS’s MVR580 million (US$37.6 million) ‘Blue’s Housing Project’ 210 three-bedroom and 90 two-bedroom apartments will be built. The housing scheme was described as being important for the maintenance of the police force’s welfare by Commissioner Riyaz during the project’s foundation laying ceremony in March. Acting Home Minister Ahmed Shafeeu presented recipients with the official documents yesterday (September 2). Apartments were awarded to officers with at least 20 years of service and based on a points system used in other housing schemes, Chief Superintendent of Police Abdulla Nawaz told local media. The awarding of flats marks the beginning of the POLCO project, which is seeking private investment for a further 150 apartments, said Commissioner Riyaz during Monday’s ceremony. Last month, 50 apartments on Hulhumale’ were handed over to police officers by President Dr Mohamed Waheed, who expressed hope that more housing would be made available exclusively for police and military officers. Since the controversial transfer of presidential power involving elements of the police force, 1000 officers have been promoted and 110 new officers were hired. More recruits have been sought for a “special constabulary” reserve force, a loan scheme has been established for officers, and arrangements have been made for officers and their families to receive cheap accommodations and medical treatment in Sri Lanka. The Maldives Police Service had not responded to Minivan News’ enquiries at time of press. Meanwhile, the government has re-started construction of 300 housing units on Hulhumale’, specifically for MNDF officers. President Waheed, Defence Minister Mohamed Nazim, and senior MNDF officials laid the foundation stone for the apartment complex during a ceremony held on Hulhumale’ yesterday. The apartments will be given to female officers who had not been previously awarded housing units, as well as to retired officers, the MNDF told local media. Once constructed, the housing units would provide MNDF personnel and their families “adequate accommodation” as many are currently “living under a degree of hardship, having to rent their living spaces,” Waheed said during yesterday’s ceremony. Nazim added that the project would provide facilities such as playgrounds, a swimming pool, and a gym for residents. President Waheed also awarded 50 apartments to MNDF personnel and their families last month, although seven of these flats had yet to be assigned. Waheed noted during yesterday’s ceremony that the provision of shelter for military personnel was not an act of kindness, but rather a government obligation. “The development and welfare of personnel should be improved in accordance with financial capability of the government, and the flats awarded today provides evidence of that fact,” Defence Minister Nazim stated at the time. In April 2012, MNDF officers were given two years of allowances in a lump sum, which amounted to MVR 150 million (US$10 million) for the institution. The Maldives National Defence Force was also not responding to enquiries at time of press. The Maldivian Democratic Party (MDP) believes the award of 600 housing units to MNDF and MPS officers is a continuation of the patronage system established during former President Maumoon Gayoom’s 30-year autocratic rule. “In the light of extensive exposes, such ‘patronage’ is familiar to voters from the single party dictatorship of Gayoom and I believe they will simply say to each other ‘I told you so’,” MDP MP and Spokesperson Hamid Abdul Ghafoor told Minivan News today (September 3). The MDP previously raised concerns about whether the already constructed flats – which it contends forms part of the “Veshi Fahi” Male’ (decongestion) project launched under the previous government in 2011 – were being given to the “needy” and most deserving. Ghafoor said it was “very concerning” that police should be given flats exclusively, to the detriment of teachers, doctors and other civilians. He also questioned how officers themselves had been selected for the process. While some of the officers may have deserved the housing, there was concern that some officers involved in last year’s mutiny had been rewarded with flats, claimed Ghafoor. Last month, President Waheed requested parliament approval to obtain a US$29.4 million loan from the Bank of Ceylon to finance the government’s budget and manage cash flow. The Ministry of Finance and Treasury was seeking to secure the loan as a way to “enforce” the 2013 budget approved by parliament, stated a letter from the President’s Office read during a parliament session held on August 13. The Maldivian Democratic Party (MDP) has expressed caution following the Commonwealth’s decision to assign a security expert to observe police conduct during the 2013 presidential election. The opposition party this week questioned the Commonwealth’s previous lack of success in ensuring security force reforms, adding that it remained “highly suspicious” of Police Commissioner Abdulla Riyaz’s conduct in the build up to the election. Police announced this week that the Commonwealth had appointed Eldred de Klerk to assist with ensuring election security, a decision they declared was in line with “international best practices” after requesting the intergovernmental organisation provide consultancy services. Police Commissioner Abdulla Riyaz met with de Klerk in Male’ on Sunday (August 26) to discuss his planned work ahead of the election. Minivan News understands a similar request was made to the UN, which opted instead to work with others members of the international community to try and ensure the “smooth running” of next month’s election. Despite rejecting the police service’s request, a UN source today said it appreciated the Commonwealth’s contribution. The Maldives Police Service earlier this month launched an operation to send large numbers of police officers to islands in preparation for the presidential election with the stated aim of ensuring voting goes peacefully. Riyaz is also the subject of an ongoing Police Integrity Commission (PIC) investigation over whether he contravened regulations on political neutrality by publishing a letter written by a third party on Twitter urging officers to “say no” to former President Mohamed Nasheed. The PIC has maintained that it had received no formal complaints concerning the tweet, but was instead investigating the case on the commission’s “own initiative”. Contacted today on the status of its investigation into the post, the PIC said it was not the commission’s policy to give details of an ongoing case, while also declining to provide a time-line for whether such a “complicated” matter would be finished before September 7. In July, Commissioner Riyaz said his institution would continue to refuse any orders it deems “unconstitutional”, after expressing concerns over leaked proposals allegedly devised by the MDP to reform the country’s security forces. MDP MP Hamid Abdul Ghafoor said the party was cautious at the Commonwealth’s decision to provide an elections security consultant after it’s lack of success in ensuring the police reforms called for in the Commission of National Inquiry (CoNI) report it had backed. “We will have to wait to find out if the Commonwealth is actually trying to help diffuse mutinous elements [in the police],” said Ghafoor. The CoNI report was mandated to ascertain the truth behind the MDP’s allegations that former President Mohamed Nasheed was forced to resign from office on February 7, 2012, due to a “coup d’etat”, after sections of the police and military mutinied against the government. While the CoNI report concluded there was “no coup, no duress and no mutiny” behind the change of government, the findings did urge changes to the country’s judiciary, legislature, certain independent institutions, and the police service. The MDP added that it currently had no plans to meet with the Commonwealth’s election security consultant despite its concerns. Despite the MDP’s concerns, PPM MP Ahmed Nihan said the party welcomed the Commonwealth’s appointment of a security specialist to assist with ensuring election security ahead of what was likely to be a “highly competitive election”. Nihan said that although police should have no role in running the election or visiting polling stations – unless required by the country’s Elections Commission (EC) – it was important that officers were present in case of significant disruption. “Things can go wrong in any given circumstance,” he said, reiterating concerns expressed earlier this week by his party that “major incidents” on the day of voting could compromise a free and fair vote. The PPM maintained that it was more concerned with the competency of the country’s EC and its commissioner Fuwad Thowfeek ahead of next month’s vote – rather than security issues with the police. Nihan maintained that the PPM, along with election rival the Jumhoree Party (JP), were more concerned at what it alleged was the “mishandling” of the upcoming election by the EC, expressing particular concern over whether the commission’s president was fit for the post. He accused the EC over the last two and a half months of failing to address the party’s concerns about holding free and fair polls, claiming it “could have done better”, while also questioning the timing of allowing IT experts from India to be programming software for the commission. Nihan accused the EC of only offering rebuttals to the party’s concerns. However, EC President Fuwad Thowfeek this week told Minivan News that he had met with a PPM delegation several times in the build up to voting, providing what he called detailed queries to their questions. The Maldives NGO Federation last week expressed concern that political parties were attempting to discredit the Elections Commission (EC) by inciting hatred toward the institution in an effort to obstruct the holding of a free and fair presidential election. The Police Integrity Commisson (PIC) has confirmed that it is investigating a tweet posted by Police Commissioner Abdulla Riyaz. Riyaz yesterday posted a letter he claimed to have been sent, urging the police to “say no” to former President Mohamed Nasheed on September 7, just as they had on February 7 – an event the author described as a “jihad”. The letter, addressed to the entire police force, praised it for its “patience” in the face of Nasheed’s “cunning” and “malicious” actions during his presidency. Whilst not responding to inquiries from Minivan News today, Riyaz is reported to have told local media that he had no specific intentions in mind when re-posting the letter. Elections Commissioner Fuwad Thowfeek today told Minivan News that his office had received a complaint regarding the letter, and had opted to forward the issue to the PIC. “It is advised to be as neutral as possible – even on Facebook – so there will be nothing to complain about,” he added. EC Legal Director Haneefa Khalid currently facing an internal investigation after the Progressive Party of Maldives (PPM) accused her of posting “politicised” tweets. President Dr Mohamed Waheed told local journalists yesterday that he imagined the tweet had been posted in the commissioner’s personal capacity. When pressed on the appropriateness of such a post, Waheed said that he could not comment further without more information. Whilst President’s Office Spokesman Masood Imad told Minivan News today that he was not personally aware of the Riyaz tweet, he said the government would “express concern” over any such post which threatened free and fair elections. “We caution everyone in the country to follow election guidelines and not to play into the hands of anyone looking to undermine free and fair voting. Everyone must exercise judgement,” he added. Commissioner Riyaz last month posted an interview on the police service website maintaining that the organisation would refuse to follow any orders deemed unconstitutional. “Whichever individual becomes president tomorrow can no longer just change the constitution, the existing law. That individual, holding the presidency, can only bring such big changes with a parliamentary majority,” said Riyaz. February’s controversial transfer of power came after units of the police refused to obey former President’s Nasheed’s orders, with Nasheed resigning from office soon after. Days earlier, Nasheed had ordered the detention of Criminal Court Chief Judge Abdulla Mohamed after the latter had blocked investigations into his own misconduct. Nasheed’s decision was later described as in breach of the constitution by the Human Rights Commission of Maldives (HRCM). Riyaz was appointed commissioner immediately after Nasheed’s resignation, which Nasheed and Maldivian Democratic Party (MDP) would later claim was a police coup. The allegations were later rejected by a Commonwealth-backed Commission of National Inquiry (CoNI) that ruled that there had been “no coup, no duress and no mutiny”, while also calling for action taken against unlawful acts committed by the country’s security forces following the transfer. Police Commissioner Abdulla Riyaz has hailed a new agreement between the Turkish Government and the Maldives Police Service (MPS) as providing the means to strengthen the institution. Returning from an official trip to Turkey last week, Riyaz posted a video statement online revealing the full details of the memorandum of understanding with Turkish police. “They have agreed to give us 5 slots in a degree programme in a security studies course, as well as 2 slots in a masters programme, scheduled to start in their Police Academy next month,” he explained. The police commissioner also revealed that the MPS will, in future, be offered instruction in policing corruption, drugs, and serious organised crime. “We have also asked for assistance with obtaining police electronics, computers, vehicles and infrastructure. They appeared positive and said they will respond to proposals on a case by case, project by project basis,” he continued. The Turkish government has reportedly been offering similar training and assistance to a number of countries this year, including Kazakhstan, Turkmenistan, Albania, Mongolia, Palestine, Uzbekistan, and Azerbaijan. Riyaz’s announcement of the deal’s specifics follows criticisms by former President Mohamed Nasheed over what he believes is a lack of police reform following the publication of the Commission of National Inquiry (CoNI) report last year. Speaking at the opening of a Maldivian Democratic Party (MDP) campaign outlet in Male’ yesterday (August 19), Nasheed reportedly told supporters that he had failed to see any police reform, despite his acceptance of the CoNI report being based solely on this feature. The report, designed to investigate the circumstances surrounding Nasheed’s controversial resignation on February 7, 2012, urged changes to the country’s judiciary, legislature, certain independent institutions, and the police service. Nasheed and the ousted MDP have maintained that the former president’s resignation took place under duress during a police and military mutiny, and that the ensuing government of Dr Mohamed Waheed is illegitimate. Commissioner Riyaz, appointed immediately after Nasheed’s controversial resignation, has been condemned by the MDP for his alleged role in the former president’s exit from office. Despite his misgivings over the police’s progress towards addressing the CoNI report’s recommendations, Nasheed struck a conciliatory tone towards police, urging cooperation from his supporters. “During this period, I urge all members of this party to smile at police officers, to care for them, to cooperate with them and trust them,” he said. Local media also reported Nasheed as expressing his wish to address each police officer individually in his attempts to press ahead with reforming the institution. “I believe that Maldives cannot have stability without reforming the police service,” said Nasheed. Riyaz last month said he would not follow any unconstitutional orders, following a leaked document purported to be the MDP’s plans for introducing decentralised security services in the event of victory in next month’s presidential poll. The document was disowned by Nasheed’s party.